Why anyone – when both the beach and mountains are literally just minutes away – would choose to find their fun in a rundown half-abandoned chunk of downtown is beyond logic to me. 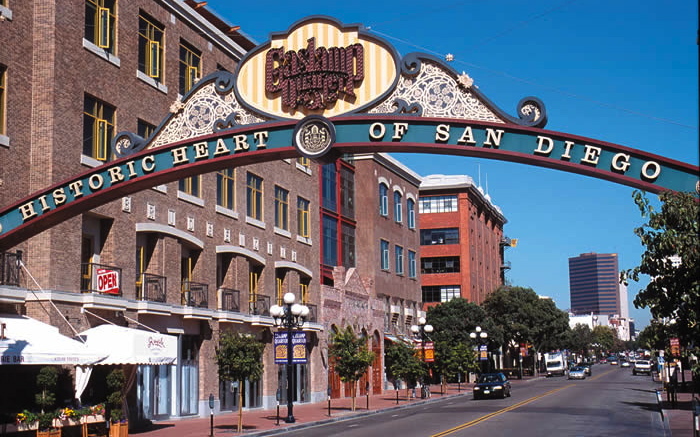 Nevertheless San Diego’s Gaslamp Quarter is being touted as a revitalized historic district despite the overwhelming presence of hobos and the waft of urine. Call me cynical but I think the term “historic heart” has more to do with the waterfront convention center which draws in some 1.3 million people a year in search of a Hard Rock Cafe and less to do with there being anything particularly interesting to see or do here. Or at least that’s my experience of wandering the Gaslamp today – allow me some wiggle room to contradict myself on this tomorrow.